Da Vinci believes that good food brings good shape. That is why we are happy to support Estonian sportsmen on their way to the top. 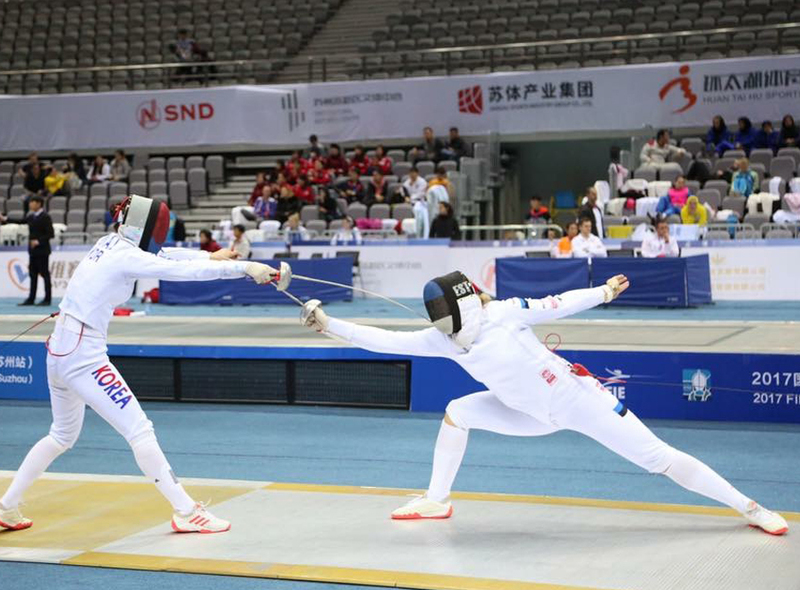 If in the previous article we introduced you a Da Vinci’s good friend and top-level golfer Mark Suursalu, then in today’s article we bring you ideas about food and modern fencing expressed by one of the best Estonian fencers, Kristina Kuusk. During competitions there is no organised catering, therefore, the competitors have to take care of their meals themselves. Days are long and tiring, “For example, the European Championships lasted for 14 hours.” Whether there is time to have a proper meal during competitions depends on the venue. “Sometimes you cannot even leave the venue and then everyone has their snacks and food supplements with them.” Kristina’s bag often contains bananas, nuts and muesli bars. When Kristina is at home, she likes to take time to have a good breakfast. “It is important for me to take those two hours to have my breakfast and do my things.” At home she often cooks chicken, fish and salads, she also likes baking cakes. Since her mother’s side of the family is from Saaremaa, Kristina also values simple and homemade food very highly. “Fried plaice, young potatoes, butter, dill…,” the top-level fencer lists her favourite Saaremaa flavours. While travelling around the world, Kristina also mostly likes to enjoy local food, but there is one little exception. Namely, when she was travelling in China and ordered chicken at a local restaurant, she was instead served fancy rooster legs with feathers and nails still in place. After this unexpected encounter, Kristina always brings along some food from Estonia when she goes to China. Just in case. However, since Kristina is very curious by her nature, she has tried several exotic animals, such as scorpion, kangaroo, crocodile and snake. Just to know how they taste. Kristina also has a secret sin: “I am mad about wine gums!” she admits. Her favourite ones are those that are with a soft texture and a little sour, especially those that are covered with a sour coating. “As soon as I smell wine gums… there is a click and I just have to get them,” she admits she often has to give in when the wonderful wine gums are in question. Da Vinci restaurants have been Kristina’s favourite places for having a meal for a long time already. When we noticed that, we decided to support the capable sportswoman so that during her busy training period there would always be a warm meal waiting for her at Da Vinci. As a great food lover, Kristina had trouble hiding her happiness. “I would have liked to do a cartwheel, but I thought that maybe I shouldn’t do circus…” she laughs. When dining at Da Vinci’s she manages to save a lot of invaluable time, especially when there are several trainings in a day. Her favourite dish in our menu is grilled trout with grilled vegetables and zucchini. She also enjoys several pasta dishes, risottos and pizza. “Wholegrain pizzas – this is a proper sportsman’s food! !” she giggles. “And I think I can never say no to a cheesecake.” Kristina says she also likes the menu changes at very suitable intervals, and she always finds her favourites from there. Kristina also praises Da Vinci’s wide choice of coffee drinks. “When at one point I started drinking tea instead of coffee, I also noticed that Da Vinci’s tea menu is also surprisingly good! I’ve even bought some as presents. And the grapefruit juice! This is a must have! Healthy, made on spot, fresh,” she summarises the good characteristics of the freshly squeezed juice. We wish Kristina everlasting positive energy and good results in fencing halls, and always hope to see her at our Da Vinci restaurants!